"Relativism" is derived from the word 'relative', which describes a 'relation'. Moral relativism is that school of thought that maintains that there are no actions that are absolutely wrong, that good and evil in human action are relative to something else, i.e., the culture in which we currently live, or social consensus, or my individual situation, that is, what I see fit, etc. Moral relativism goes back to the ancient Sophists, for example Gorgias, not to mention the ancient hedonist Epicurus. We see it in Nietzsche and Sartre in the 20th century. Currently, moral relativism is the default position; but it wasn't always so. The classical non-relativist position (natural law) on the contrary, holds that there are certain actions that are absolutely wrong and which no circumstances can justify, such as adultery, abortion, active euthanasia, etc., that social consensus can be wrong. This position goes back to Socrates, Aristotle, Augustine, Aquinas, etc. Cicero speaks of the natural law, and more recently Martin Luther King Jr in his Letter from the Birmingham Jail says some very eloquent things about this law. John Finnis, Germain Grisez, and Joseph Boyle are three contemporary moral philosophers who have articulated extensively the principles and implications of natural law. To appreciate the radical difference between relativism and the non-relativist position in morality, I'd like to call your attention to the essential difference between man and brute animal. The greatest delight an animal experiences is sense pleasure, that is, the satisfaction of its passions. Man, on the other hand, is capable of a higher delight, a cognitive delight, namely, the experience of beauty. Man is the only animal who leisures, and leisure is about the contemplation of the beautiful. When we experience the beautiful, the intellect delights in the intelligibility, integrity and harmony of the real world outside the self. This experience of the beautiful includes the possession of truth-because truth is complex and harmonious-, the contemplation of works of art, or the delight in watching a well-executed strategy of a game, etc. Recently while on retreat in a Monastery in New York State, I visited an art gallery with a friend. I was very much impressed by the beauty of the art; the artists captured well the beauty of the landscape. The delight was not the same as the experience of pleasure. Pleasure is entirely in the self, but the delight of the beautiful is of an ecstatic kind (from the Greek ecstasis, or exit of self). A truly beautiful work takes you out of yourself and brings you in touch with the radiance, unity and harmony of the real world outside the self. Relativism comes out of a very different conception of the human person, one that sees the human person as essentially no different than a brute animal. For animals, pleasure is the highest delight. Jeremy Bentham, 19th century British philosopher, formulated the utilitarian principle: "the greatest-happiness for the greatest number of people". But the word happiness here does not have the same meaning as happiness (eudaemonia) in Aristotle or Socrates. For Bentham, happiness is pleasure. Now pleasure is relative. It is not universal, it is not stable; for it constantly changes. To impose stability or permanency on pleasure is cruel. Imagine a mother who responds to her child's delight in his favorite meal by promising that she will serve him the same meal every day, with the same dessert, followed by the same television show every night, night after night, etc. This would soon become a maddening existence. I am reminded of the Twilight Zone episode entitled A Nice Place to Visit, in which criminal Rocky Valentine thinks he's died and gone to heaven, because he's given all the money he wants and is allowed to spend it in whatever way he wants. His desires are satisfied in everything he does. He soon finds this kind of existence meaningless and in the end it becomes intolerable. He then asks permission to go to hell, or what he refers to as "the other place". He is then told that he is in the 'other place'. His hell is to spend eternity delighting in the satisfaction of his every pleasure. Relativists cannot understand the non-relativist position, and the reason is that pleasure always gets old; what pleases can even become revolting. The relativist sees the non-relativist as wanting to impose stability and permanency where none should be imposed, because life is about the greatest pleasure for the greatest number. Why should I settle for the same woman year in and year out? Why should I raise this child whose birth will disrupt my plans? When pleasure is the highest delight, permanency makes no sense. Picasso is a great illustrator of this. He had many mistresses, and at the beginning of his relationships, he would often draw them a sketch in traditional art form, as a kind of love note. But soon his mistress would become revolting (see above), as does anything that has become an object of consumption. And so he came to experience their ugliness, and that would appear in his paintings. He would distort them, thus expressing the ugliness he came to behold in them. These works are caricatures. Our current culture is relativistic; as I said, that is the default position today. That was not the case when I was growing up-relativism was the position of a few rebels. Now, as pleasure dulls, people crave more and at higher intensities. Notice that today there is a hunger for more extreme pleasures, thus more demand for extremes, like extreme sports and extreme forms of entertainment. We as a culture become easily bored, because pleasure is at the center of our existence, and relativism is the only moral position that makes sense for a culture in which pleasure is at the center. As I was looking at these beautiful works of art in a gallery in Upstate New York, I suddenly felt like painting again. Then I remembered something that I briefly forgot, namely, how tedious painting is. It is work, taxing, not a constant state of artistic exhilaration that lasts all the while you are painting. It is slow and monotonous. But if you are a good artist, the result is a work of beauty, and for others, it is an experience that is ecstatic, an experience of being lifted out of oneself and into something larger than oneself. Experiencing beauty is not about consuming, but about being lifted up into something larger, a reality that overflows with radiance and meaning. Now, not all of us can be fine artists; we don't have the time, inclination, or talent. But all of us are called to be artists of the highest kind. We are called to be sculptors of beautiful character. Morality is about 'character'. The word 'morality' is from the Latin mores, and 'ethics' is from the Greek word ethos, both of which mean 'character'. Character is not the same as personality. One can have a great personality, but depraved character-criminals usually have charming personalities; and one can have a dull personality, but great and noble character. Our highest achievement is the sculpting of noble character. The Greek word kalon, which appears in the Nicomachean Ethics of Aristotle, is best translated as the morally beautiful (from kaleo, which means 'attractive'; for what is beautiful 'attracts'). Character describes the kind of person we make ourselves to be by the choices that we make. There are certain kinds of actions (i.e., murder is a different kind of action than self-defence, etc. ), and only certain kinds of people choose certain kinds of acts. The moral life is about becoming a certain kind of person, a morally beautiful person. Like all artistic production, the work is slow, hard, tedious, and monotonous. It involves sacrifice and self-discipline, but the end is the production of a beautiful work, namely morally beautiful character. None of this makes any sense to the moral relativist. For him, it is pleasure that is the highest delight; and so for the relativist, morality is about making those choices that create the conditions most conducive to a life of pleasure (the greatest pleasure for the greatest number). Happiness is a matter of having (having enjoyable experiences), but for the non-relativist position, happiness is a matter of being (a matter of character). A moral choice establishes a relationship between the will and intelligible human goods, which are aspects of human flourishing. Noble character relates well to human goods; a good will is one that wills the good wherever there is an instance of it. Deficient character establishes a deficient relationship to the good; a partial or qualified love of the good; there is a disordered love of self. In other words, the self is loved as the ultimate end, and everyone else is loved insofar as he or she serves that end. That is why it is okay to abort a child if it is inconvenient, for example. The happiness of the relativist is pleasure; but the happiness of the non-relativist is an ecstasy, an exit of self, akin to the experience of the beautiful. Man differs from brute animal in that he possesses intellect and will. It is through these two powers that the human person can become something other than himself. Aristotle pointed out long ago that when we know the nature of a thing, the essence of that thing exists in the mind of the knower. The mind becomes what it knows in an immaterial way. Through knowledge, I become more than what I am, without ceasing to be what I am. I am what I know. This is an intellectual self-expansion. However, through the will, I can also become someone other than myself. I naturally will the best for myself, but I do not naturally will the best for you. I have to freely choose to do so. I naturally love myself and want the best for myself, and I know that you too desire the best for yourself. I can choose to will the best for you as if you were another me, another self. I have that ability to go outside myself and exist as you, without ceasing to be myself, so that I am no longer one, but two. And if I love a third person as another self, then I become three, and four, and five, etc. A morally good person loves human goods whenever and wherever he finds them. A morally beautiful human being is an expanded human being, one who lives outside himself in the other. The artist paints, labors, so that you can be brought out of yourself and experience the beautiful, that is, in order that you experience ecstasy. So too, the morally noble man or woman disciplines the passions and cultivates the virtues so as to be able to love ecstatically, to exist outside himself or herself in the other, for the good of the other. The difference between the happiness that follows upon moral integrity and the life of pleasure is hard to convey, especially if one has not experienced it. The highest kind of happiness is much greater than the ecstatic delight in the beautiful; it is like that insofar as delighting in beauty is an experience of being taken out of oneself. But think of the exit of self that is involved in loving another as another self. When we are so loyal to the good, to every instance of intelligible human goodness, that wherever there is a human person, that person is loved for his sake, as another self, we have expanded ourselves without qualification. The happiness of others becomes our own. That's a very difficult thing to achieve - we are far more selfish than we are aware of. But the happiness that results from such an expanded mode of existence is so deep and pervasive that its description means very little to those who have not begun to taste it. It is the happiness of existing both outside the self and within the self. Just as it is only in knowing something outside myself that I become present to myself, so too, the more I exist outside myself through an act of the will that loves the other as another self, the more fully do I become the person that I am ("anyone who loses his life will find it; anyone who finds his life will lose it"). The moral life is all about cultivating the virtues, which are habits, and as you all know, bad habits are hard to break, and good habits are hard to acquire. The intellect is perfected morally by the virtue of prudence, the will is perfected by justice, the concupiscible appetite and its emotions are perfected by temperance, and the irascible appetite and its emotions are perfected by fortitude. A prudent, just, temperate and brave person is a morally beautiful human being. Moreover, moral beauty imparts a kind of physical beauty. What takes place on the level of the soul spills over into the realm of matter. I recently saw a Facebook picture of a few of you, and what struck me about you all was the beauty of innocence that radiates from your faces. You radiate beauty in a way that Hollywood simply does not; your commitment to your faith in the midst of an anti-religious environment makes your faces radiate. So how do you sculpt ugly character? Be a relativist. 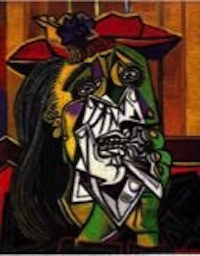 Picasso exhibits the ugliness that relativism begets. In a relativistic world, everyone eventually is going to find you ugly, and in due time you are going to find everyone else ugly. What is new will appear exciting, but it will soon get old, just as a new dish is exciting and tasty at first, but it gets old, and in time it may even become revolting. In that case, you search for a new restaurant or a new recipe. That's why relativism naturally leads to adultery, fornication, contraception, divorce, etc. Things get old, and so we want to experience what is new, but traditional non-relativist morality, by imposing permanency, takes the fun out of life. How do you sculpt morally beautiful character, and thus a morally beautiful countenance? Commit to the good; follow the eternal law; love that law, which is larger than you, me, and the civil community as a whole. Learn to love human beings for their own sake, not for the sake of what they do for you. That is the secret to looking beautiful, and that is the secret to a life that is beautiful, heroic and meaningful.